Imagine suddenly waking up in the middle of the night with excruciating pain in your big toe. You’d find it difficult to walk, and even the gentle pressure of a duvet resting on the affected foot would be agonising. It sounds like a nightmare, doesn’t it? Sadly, this scary situation is a reality for many people who suffer from a type of arthritis known as gout. That’s why it’s crucial to understand what causes the problem, as well as how to manage and prevent it. Gout is not only unpredictable and debilitating but also relatively common. According to the UK Gout Society, one in 14 men and one in 35 women will develop this joint disease. The problem occurs mainly in the lower extremities – the knees, ankles and feet – with big toe joints at the greatest risk. The NHS website includes a photo of a gouty big toe; the skin looks extremely red and swollen. People develop gout as a result of hyperuricemia, i.e. high levels of uric acid (a waste product) in the bloodstream. Uric acid crystals build up around the joint at the base of the big toe and other joints, ultimately tricking your body into thinking it’s under attack. White blood cells try to defend you by surrounding the crystals, leading to the severe joint pain and inflammation familiar to gout sufferers. Gout pain can last for more than a week and often returns. To reduce the likelihood of permanent joint damage, urgent medical treatment is vital. Your doctor may prescribe medicine to lower uric acid levels, as well as anti-inflammatories. If a gout attack makes your big toe hurt, there are several things you can do to make your foot more comfortable, in addition to taking your gout medication. Avoid wearing shoes, slippers and restrictive hosiery. 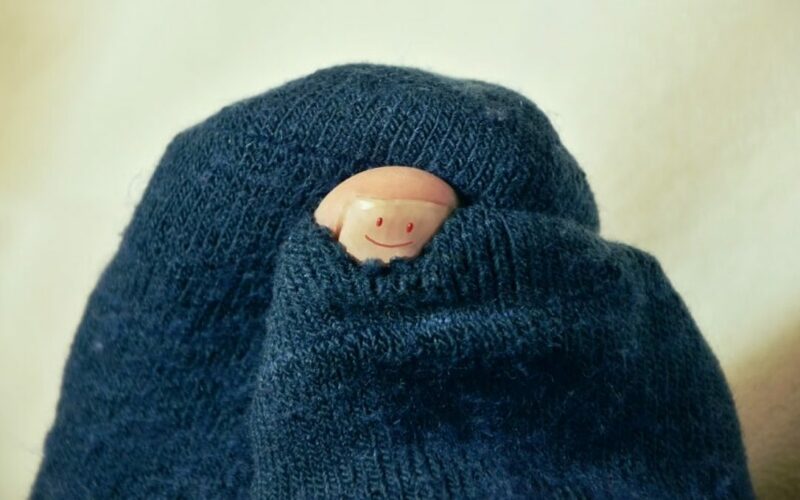 You could even cut off the top of a sock to avoid putting your big toe under pressure. Wrap an ice pack in a towel and apply it to your big toe for short periods. Doing so should soothe the area and reduce the swelling. When you lie down, elevate your foot with the aid of cushions or pillows, so that it’s slightly higher than your chest, as this can also keep the swelling at bay. Leave your foot uncovered overnight. When you consider how much pain gout causes, it makes sense to try and prevent the problem flaring up. A key approach is to consume fewer foods and drinks containing high levels of purines, substances that lead to a uric acid build-up. A low-purine diet means avoiding beer, rich meats such as bacon, pork and liver, as well as many types of fish, seafood and shellfish. The link between gout and over-indulgence is why the condition was known historically as the ‘rich man’s disease’. Being a healthy weight, drinking plenty of water to flush out uric acid and exercising regularly can all help you to avoid gout attacks. Gout can’t be cured, but it can be managed effectively – and ensuring that your feet receive expert care plays an important part in that process. Our London podiatrists can help to relieve the pain caused by gout in your big toe (or elsewhere in your foot) with prescription orthotics. These custom-made shoe inserts are designed to make the affected area more comfortable by reducing the pressure it’s under. What’s more, we can offer expert advice on which shoes you’ll find most comfortable. Podiatric padding and foot shields can be beneficial when gout strikes. In addition, if the swelling has led to sores, ulcers, calluses, etc., we can treat those issues too. For expert help to relieve the foot pain caused by gout, please call Feet By Pody today on 0207 099 6657 or book a podiatry appointment online.